The Legend of Papa Noel puts a nice Cajun twist on the idea of Father Christmas. In this book, Papa Noel comes down the Mississippi River to make his deliveries to all the good little girls and boys in the bayou. And just in case you might get lost in the story, there is a Pronunciation Guide on the first page so you can work through these French words and follow this tale. The book is written by Terri Hoover Dunham who was born in Baton Rouge, Louisiana. The illustrations which perfect this story are done by Laura Knorr who caused me to think I was on the Disneyland Pirates of the Caribbean ride as I was reading along. Love the dark shadows and alligators that bump into cypress knees, stumps and logs. This book is definitely a different sort of Christmas story, but it's lots of fun! Slightly more traditional - I suppose - is The Night Henry Ford Met Santa . Good ol' Henry is having a problem. He can't figure out how to make his cars more economically priced so that more people can afford them. Enter his young son and a little help from Santa, and Henry sees the value of the elves production line! Walla! Henry receives his Christmas present from Santa and our world has not been the same since! 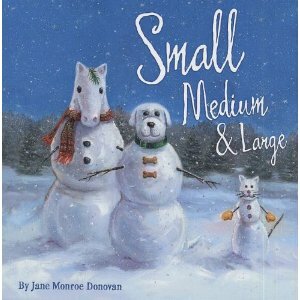 Small, Medium and Large is a wordless picture book. However, it does open to the scene of a young girl writing a letter to Santa and expressing the fact that she doesn't need any new toys this year. Instead, she'd like to open up her home to some animal friends. Specifically she'd go for a dog, cat and pony. (Know any young girls like this?) The rest of the book is full of fun animal play in the snow. It's a cozy book to read through and quite adorable. Lastly we have First Dog's White House Christmas . 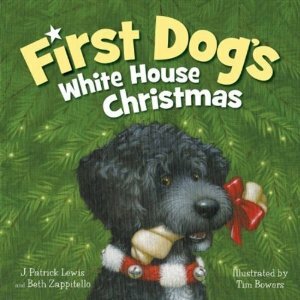 In this book, we meet the nameless dog who resembles a current white house pooch, who wants to invite some of his friends to the White House Christmas Gala. Dogs and their owners from all over the world end up attending the Gala and our White House dog learns about Christmas traditions that dogs keep up with their families all over the world. This book is a "sequel" of sorts to First Dog , excepting the fact that the topic of this new title deals with Christmas. I really thought this was a clever way to introduce kids to the idea of different cultural traditions. Thank you, Sleeping Bear Press, for your generosity and congratulations to Krista! Why do I have to make such hard decisions. All these books look adorable. I just love picture books. We love Christmas books! Thanks for the giveaway! I think the Henry Ford meets Santa looks adorable! Super cute! Henry Ford meets Santa! Sweet books. Hard choice!! I think Small Medium and Large! Thanks for this giveaway! I think Henry Ford Meets Santa and Small, Medium, or Large look fun! They have such a great variety in books! 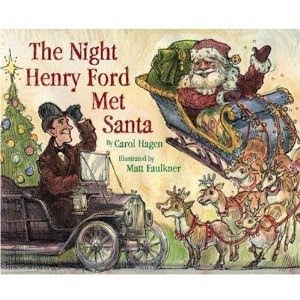 For the back title, I'd like the Night Henry Ford Met Santa...for my dad to enjoy with his grandkids! I think I'd pick the Henry Ford story for the older book--my dad worked for Ford until I was 18 years old. It looks like a cute one! Thanks for the giveaway, Carrie! Hope your Thanksgiving was fun! I love all of the books, but I think Papa Noel sounds a little more unique. Fun giveaway! As a Michigander, I'd have to go with Henry Ford! I like the Henry Ford book for the back title options. I have to go with The legend of Papa Noel. We love picture books- even the teen boys! I would like the henry ford meets santa claus book. I would like the Small, Medium Large Book. It looks like a good one! I would choose the Papa Noel book. Papa Noel and the others! Thank you SBP! We love you! Can never have enough Christmas books! I'd choose Henry Ford meets Santa for my car-loving husband and son! What, I have to pick??? My mother in law speaks French so she would love to read the Cajun one... but I have a special place in my heart for Ford as my uncle used to work there and I've gotten a tour and been to Ford's house/museum! So I'd probably pick the second one! Cool...First Dogs in the White House Christmas or Small Medium Large. When my children were little we wrapped up all the Christiams books plus one new one. Each night we'd turn on the Christmas Tree lights and cuddle down to read the surprise book. It was a little bit of quiet into the hustle and bustle of the season. All of these books look so cute! I would choose The Legend of Papa Noel. Thanks for the chance to win. It is a hard choice but I would have to choose Henry Ford since my husband would love reading it to my daughter. the first dog's first Christmas book looks adorable!! thank you for the chance to win! for the backlist choice, i'd go with papa noel. Oh, gosh, I'd be excited to win this. 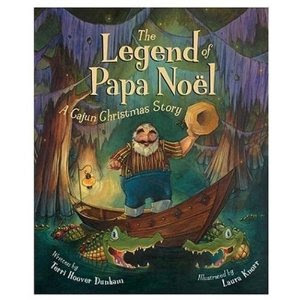 My son has some Cajun blood, so I'd love to win The Legend of Papa Noel along with the other! Thanks so much!!!!! These would be great additions to our library. Henry Ford would be my backlist choice. I'm interested in Papa Noel. I just forwarded your blog to a couple people. I wish you could have met Marie Prys, who attended Westminster until June when they moved to Virginia and edits Christian books.